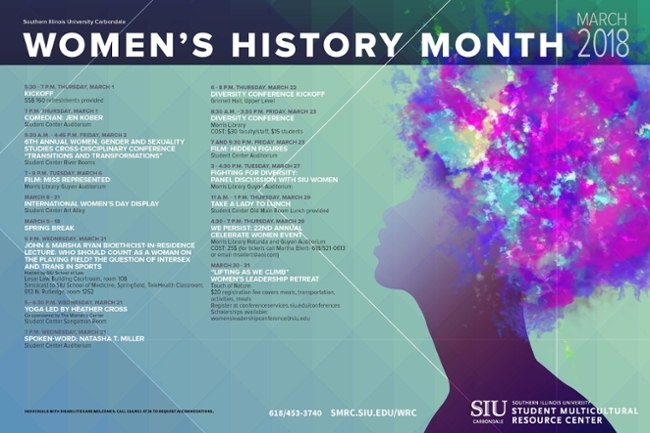 CARBONDALE, Ill. -- “Nevertheless She Persisted: Honoring Women Who Fight All Types of Discrimination Against Women” is the theme of Southern Illinois University Carbondale’s month-long 2018 Women’s History Month celebration. Conferences, guest speakers, movies, a retreat, and numerous other activities are planned throughout the month of March. Events are open to the public and most are free.